Every April, with principal funding provided by the John S. and James L. Knight Foundation, O, Miami produces the O, Miami Poetry Festival, a month-long initiative with the mission of every single person in Miami-Dade County encountering a poem. The next festival begins on April 1, 2019. Sign up for our newsletter for updates and go to our events page. O, Miami is a community-based festival. 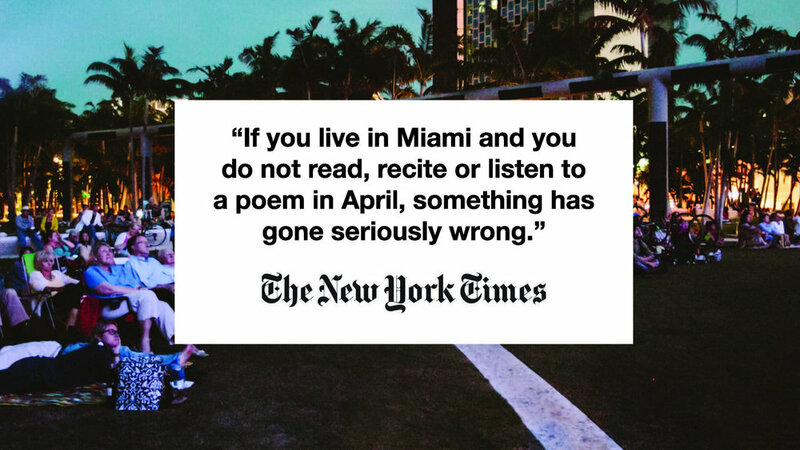 We like to say it's a "Miami" festival first and a "poetry" festival second because the poetry is simply the means by which we celebrate our home. The featured artists of O, Miami are the citizens of Miami themselves, but we are also proud to have hosted artists such as Anne Carson, Kay Ryan, Juan Felipe Herrera, W.S. Merwin, Raúl Zurita, Kevin Young, Robert Hass, Patricia Smith, Antibalas, Manual Cinema, Martine Syms, Sonya Clark, Thurston Moore, Richard Blanco, Tracy K. Smith, Megan Amram, Kool Moe Dee, Hanif Abdurraqib, and Reina María Rodriguez. The best way to understand what we do is to check out photos and videos from previous festivals. For photos, "like us" on Facebook and look through our photo albums. For videos, check out "What We Do" or go to our Vimeo page.